Presto America's Favorite Foods has been providing Italian restaurants, pizza shop operators, colleges and universities with both highly specialized service and a distinct inventory of products for nearly 50 years. 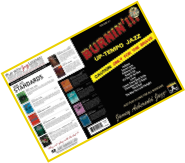 Now, for almost 42 years, the name Jamey Aebersold has been literally synonymous with the very best in jazz education materials. A world-class performer and a very charismatic teacher/lecturer who has traveled the globe giving seminars and workshops, Jamey's lifelong mission is to teach people how to play jazz and improvise.